Heirloom rice varieties come in grains of astonishing colors: brown, black, pink, purple, and pearly white; fragrant, nutty in taste, high in fiber; healthy to eat; a gourmet’s delight. Yet for all their captivating look and taste, they thrive in the most fragile places, on mountain tops, where dew, rain, and air are their only means of sustenance. 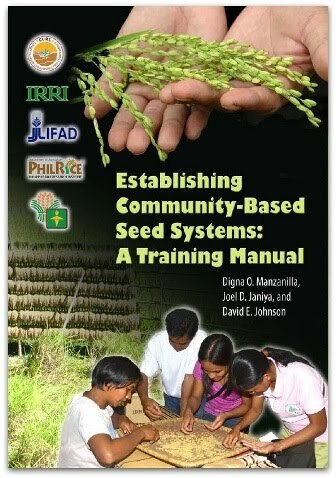 Ways to preserve, protect, and bring heirloom rice to the market were the focus of discussion by representatives from the Philippines’ Cordillera Administrative Region (CAR), the University of Southern Mindanao, and other stakeholders in a series of meetings under the Heirloom Rice Project. The Heirloom Rice Project was conceived during one of the need identification sessions conducted by Technical Innovation Services (TIS), one of the CURE components under Working Group 4 (Uplands), currently funded by IFAD. In support of the Philippine Department of Agriculture’s (DA) Food Staples Sufficiency Program (FSSP), DA and IRRI have signed a memorandum of agreement in 2013 to fulfill DA’s goal of meeting the domestic requirement for rice by 2013 and beyond. FSSP aims to strengthen the national resilience in food against the impact of climate change. One of the seven projects identified and supported under this collaboration is this project on Raising Productivity and Enriching the Legacy of Heirloom/Traditional Rice through Empowering Communities in Unfavorable Rice-Based Ecosystem, hereafter called the Heirloom Rice Project. 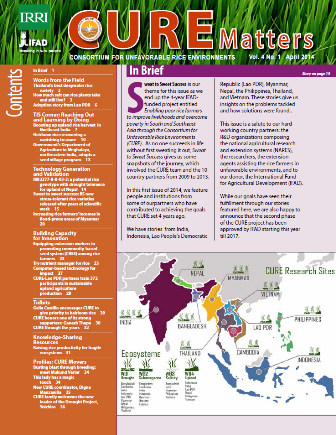 Specifically, the Heirloom Rice Project aims to enhance productivity and livelihood and conserve in situ on-farm farmer-preferred heirloom/traditional, climate-resilient varieties and upland food crops by increasing productivity of these varieties through technologies, processes, and management options to smallholder groups and enterprises as models. Many of the heirloom or indigenous rice varieties are grown in the CAR and certain regions of Mindanao such as the Arakan Valley Complex (AVC) and Lake Sebu in Cotabato Province. The project will cover the two regions ofCAR and AVC. The project has four main components: (i) varietal product identification and characterization, (ii) local capacity enhancement and enterprise building, (iii) linking smallholders to value chain, and (iv) documentation of models and knowledge management, and M&E. The pre-project launch was held at IRRI last February 11-12, 2014 with stakeholders from Department of Agriculture (DA)-Regional Field Offices (RFO)-Cordillera Autonomous Region (CAR), University of the Philippines Los Banos (UPLB), Non Government Organizations (NGOS), PhilRice, IRRI and State Universities and Colleges (SUCs) representatives from CAR and Mindanao. The research and development activities of the project were discussed and verified based on identified target beneficiaries and stakeholders. At the pre-project launch, Dr. Casiana Vera Cruz, IRRI plant pathologist and project leader, gave an overview of the project, while Dr. Ruben Miranda, co-project leader and leader of the Upland Rice Development Program of PhilRice, gave a background on identification of target self-help groups (SHGs) and component activity on local mobilization and capacity enhancement. The overview of component activities on linking smallholder groups to the value chain, documentation of models and processes, knowledge management, and monitoring and evaluation was discussed by Dr. Digna Manzanilla, IRRI social scientist and co-project leader. Heirloom rice varieties exported to the USA by Rice, Inc.
Jimmy recalled that, in 2005, 8th Wonder, a non-government organization from the USA, came to our place to buy heirloom rice. For us to be able to export heirloom rice, Ms. Vicky Garcia, founder and executive director of RICE Inc., organized us into a formal farmer-cooperative. In 2006, we were registered formally as RTFC. Local demand. Unlike Cordillera farmers whose heirloom rice has reached the export markets, Mindanao farmers target the local markets for their heirloom rice and traditional varieties. 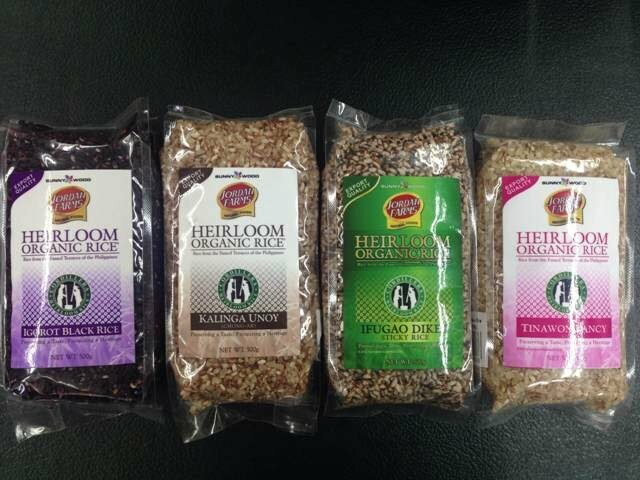 Although more costly than modern varieties, heirloom rice is in great demand locally. Dr. Rose Hondrade, professor at USM and CURE collaborator, reports that the farmers’ CBSS marketing strategy in Arakan is to sell seeds instead of grains.The idea of creating a traditional seed upland rice value chain is most welcome. Dr. Matty Demont, IRRI senior economist and market and value chain specialist, said that one of the pathways for heirloom rice to expand its market horizon is through a sustainable food value chain (SFVC). SFVC is the full range of farms and firms and their successive coordinated value-adding activities. These activities produce raw agricultural materials and transform them into food products. These are then sold to final consumers and disposed after use, in a profitable manner throughout the chain. Elaborating on Dr. Demont’s discussion, Dr. Alfred Schmidley, IRRI value chain specialist enlightened the participants with his topic on community SHGs as business entrepreneurs: opportunities and challenges. He explained that a business model describes how an enterprise creates, captures, and delivers value. He cited the need to describe key partners, activities, resources, value proposition, and profit, picking up on Cambodia’s experience in mechanical paddy drying and rice milling. In this particular example, the learning alliance, technical support, and training were synchronized to result in enabling the farmers to become entrepreneurs in the long-run. The Heirloom Rice Project in CAR was formally launched at Benguet State University, Benguet Province, on March 11-12, 2014.The launch was complemented with a regional stakeholders’ consultation and planning workshop coordinated by the DA-CAR Regional Field Office. Participants discussed the roadmap for heirloom rice production in CAR to support the 60-ton rice export target of the Philippine government. In her opening message, Dr. Marilyn Sta. Catalina, Regional Director, DA-RFO, CAR, highlighted the region’s goal to preserve the cultural heritage of heirloom rice, to make heirloom rice more competitive in the global market, and to have a partnership with other stakeholders. Dr. Vera Cruz discussed the details of varietal product characterization to identify the unique characters of heirloom rice varieties. These characters are bases for varietal registry and labeling of heirloom rice for the market. Dr. Choy Mamaril, designated head, Plant Variety Protection Office (PVPO), Bureau of Plant Industry, discussed the importance of plant varietal protection, particularly for the existing heirloom rice varieties intended for export. He emphasized the need to register the heirloom rice varieties at PVPO to protect the community’s ownership of these varieties. Dr. Manzanilla talked about the third and fourth components of the project on linking smallholder groups to value chain, documentation of models and processes, knowledge management, monitoring and evaluation. She noted that gaps and priority interventions could be identified for heirloom rice community-based production through value chain analysis. Mr. Democrito Rebong, PhilRice station manager, who represented Dr. Miranda, described in detail the component activities on local mobilization and capacity enhancement of target SHGs. Registration under Geographical Indications is another way to protect the identity of heirloom rice in CAR, as explained by Ms. Jeanne Dugui-es of the Intellectual Property Office of the Philippines and field operation specialist for CAR and Region 1. The partnership among various stakeholders from DA-RFO-CAR, ATI-CAR, PhilRice, and IRRI was formalized with the signing of a memorandum of agreement. Dr. Lorna Calumpang, Ms. Isabelita Oña, Dr. Digna Manzanilla, and Dr. Casiana Vera Cruz work at International Rice Research Institute (IRRI), Laguna, Philippines.